When I was a kid one chocolate chip cookie dominated the landscape. Do I even need to say it? Nestlé Tollhouse. The only secret was to make sure you didn’t bake them all the way so they stayed soft after they cooled. Then came Mrs. Fields. 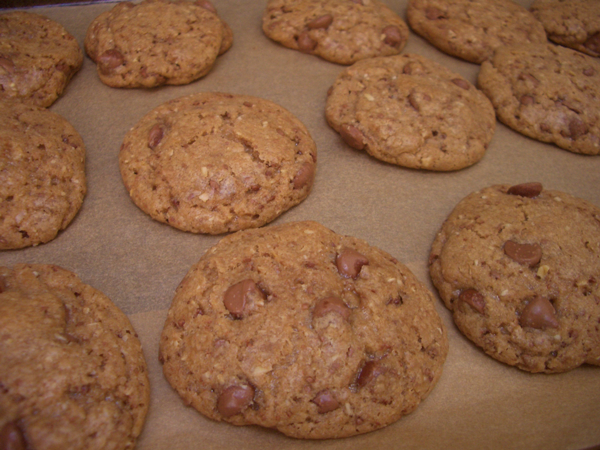 Then, if you were a Bay Area resident, Blue Chip Cookies. 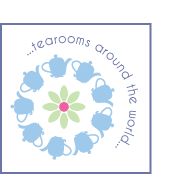 Random bit of trivia–my old high school chemistry teacher was one of Blue Chip’s founders. Now it feels we’re in the age of the “best” chocolate chip cookie throwdown. But here’s the thing, we all like different things in a cookie. Soft, chewy, crispy, sweet, salty. Some people can’t get enough chocolate in their cookies, while some like just a hint. So what’s my point? 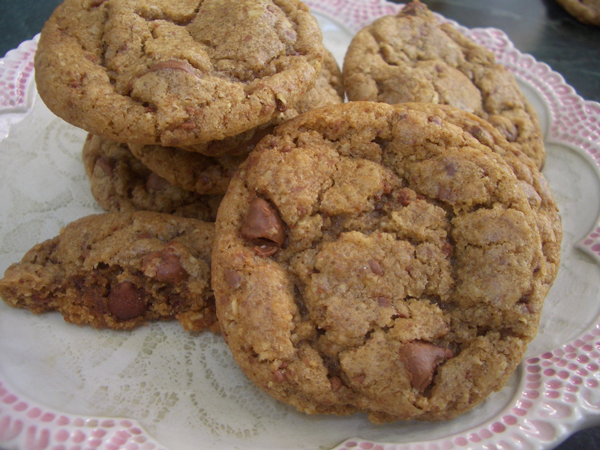 This is a very good chocolate chip cookie recipe. 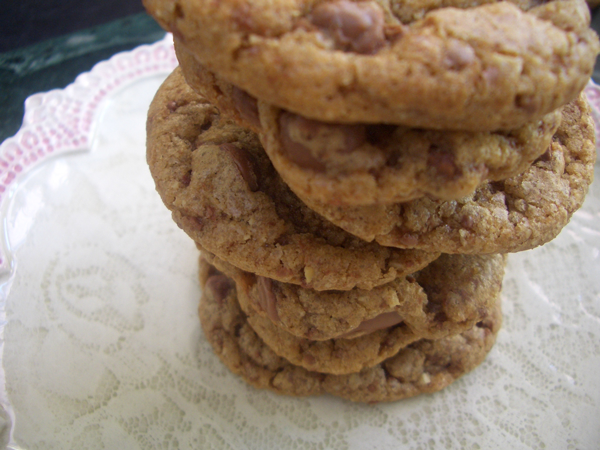 The oats and the ground up chocolate are a nod to the pirated Mrs. Fields recipes of old. They’re a little crispy on the outside, chewy on the inside and are strewn throughout with little chocolate flecks and the occasional chocolate bomb of a morsel. They’re really not going to make anyone miserable, in fact they might make someone’s day, but I won’t call them the Best Ever, because I’m here to start a conversation not an argument and… them’s fightin’ words. 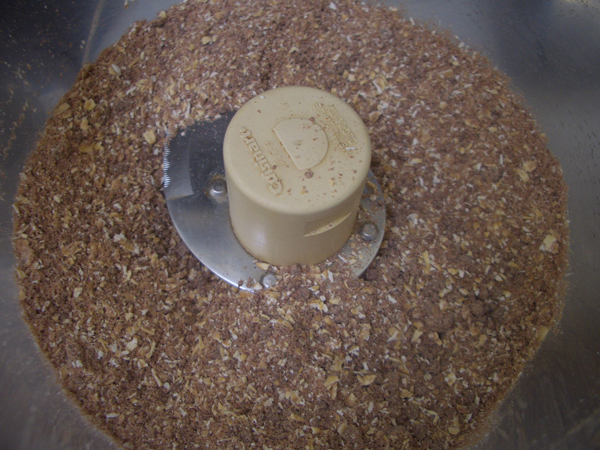 In a food processor fitted with the metal blade, pulse 1/2 cup of the chocolate chips and the oats until you get a fine powder. Using either a stand mixer, hand mixer or large bowl and wooden spoon, combine the butter and sugars and mix until well blended–several minutes. Add the eggs and vanilla and mix again for about a minute. 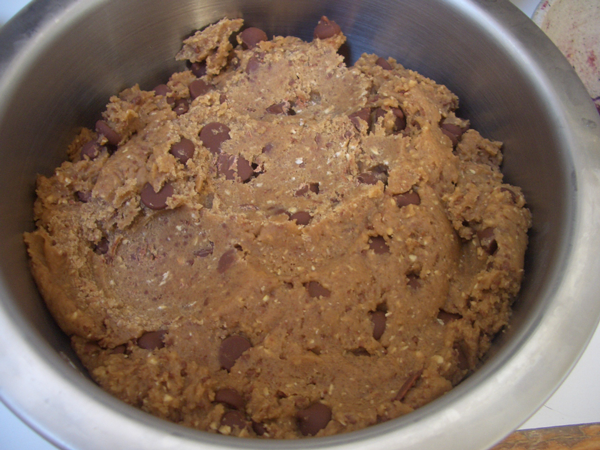 In a smaller bowl, combine the flour, oat and chocolate mixture, baking soda and salt. Whisk until well combined. Add the flour mixture to the butter mixture, a little at a time, making sure everything is well blended before adding the next bit. 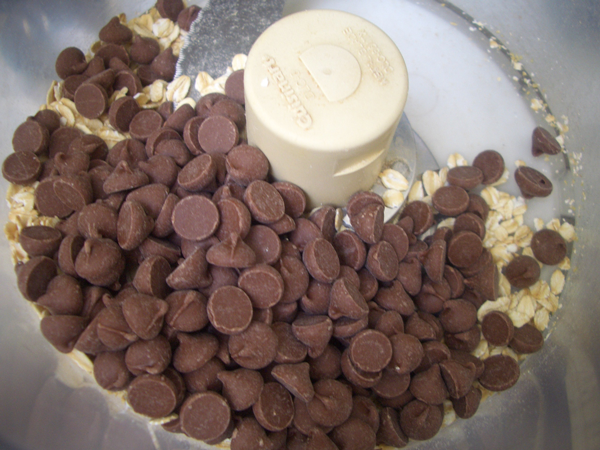 Add the remain cup of chocolate chips and mix until evenly distributed. At this point you can either bake the cookies or refrigerate the dough for a day or two. Preheat the oven to 325 F (165 C) degrees. 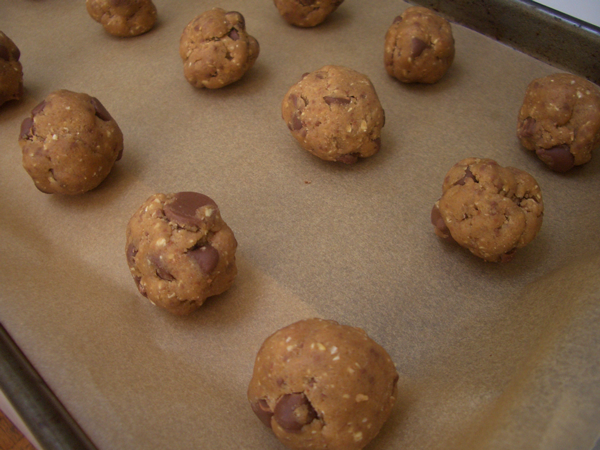 Bake the cookies on a parchment lined cookie sheet for about 10 minutes. There will be a mere hint of golden color at the edges, but nothing more. In other words, they’ll look a little raw. Cook them longer and you’ll have a lovely set of 45 hockey pucks for the kids to bat around the house. Store in an airtight container so they keep their chewiness.